In countries across Africa, Asia, Central Europe, and Latin America an increasing number of institutes and organisations are turning to cash transfer programs, or CTs, to help decrease poverty, encourage human capital accumulation, and protect households from disasters and other risks. Cash transfer programs reach across a wide range of levels to target the specific needs of each area, providing the necessary benefits to cover enough of the needs for each group it is designed for. Throughout the developing world CTs are now enjoying remarkable success, especially in supporting early childhood development goals. The concepts presented on Cash Dividends expounds on the material from the book with the same title, giving a broad scope of knowledge in how CTs run, from the set-up to the running and maintenance. Cash Dividend provides expert insight and references to aid in setting up cash transfer programs for individuals from government ministries, NGOs, multilateral institutions, and research organizations. 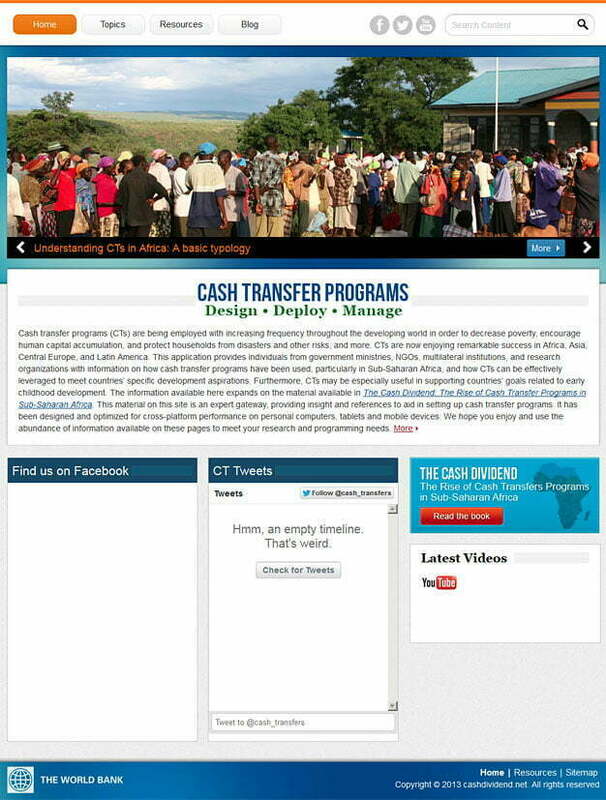 With relevant information on how cash transfer programs have been used, particularly in Sub-Saharan Africa, this cross-platform gateway explains how CTs can be effectively leveraged to meet each country’s specific development aspirations. To get the most out of their internet presence, Cash Dividend needed a way to present charts, maps, videos and other features presenting reference material in as simple a format as possible. Logistics of completed projects, program scale and cost estimates along with other tools for evaluation and monitoring were also a requirement. Pulse built the Cash Dividend system on a custom WordPress template and added advanced features such as Google Interactive Charts, Video Scribbling, Animated Transactions, Flip Book and Custom Interactive Map to fulfil each requirement. It has been designed and optimized for cross-platform performance on personal computers, tablets and mobile devices, enabling access to those working on site as well as organisers, managers, and team members. Contact Us for your web design needs.